CNIM has announced the launch of the third phase of the Purpose Built Tools (PBT) framework agreement signed with ITER Organization in December 2016. This agreement covers the engineering, manufacturing and installation of special tools for the installation of ITER Tokamak. It entails the design and manufacture of extremely large lifting systems to handle parts weighing up to 4 metric tons. These structures, comprising two 8-level towers (18 meters tall) weighing some 40 metric tons, will equip the Sector Sub-Assembly Tools (SSAT). The SSATs will be used to assemble each sector of the vacuum chamber of the fusion reactor before its transfer to the reactor building where they will all be assembled. Under the same contract, CNIM has also been entrusted with defining nine types of special, strategic tools for ITER. 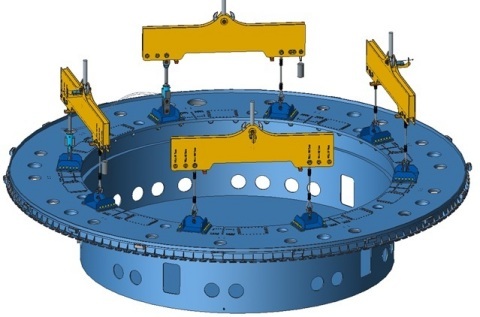 These include the handling systems to be used to position the cryostat base (the heaviest ITER component weighing 1,250 metric tons) and the Toroidal Field Coils Pairs in-pit Installation Tool (positioning to within a millimeter 700 metric tons and 17 m tall superconductor magnets). CNIM has also been entrusted with installing the two SSAT tools on site. This project is now well under way, with the first SSAT already at the functional test phase. Mechanical and electrical assembly of the second SSAT are being finalized prior to operating tests under load. CNIM teams will conduct these tests using two mockups, 14 meters tall and 8 meters wide with a weight of 390 metric tons, positioned on the SSATs to simulate the toroidal field coils. The SSAT tool must ensure high precision in moving, to within one millimeter. Delivery of this assembly is scheduled for the first half of 2019. CNIM has dispatched some 20 staff to work on site for this purpose.